It’s almost counter-intuitive to the concept of mobility, but I find that I’m carrying more devices than ever, even as both hardware and software continue to improve. When I’m not toting numerous devices, I’m actually spending more time deciding which devices to bring and which are staying home. Granted, I could be an outlier; since I cover the mobile device scene for a living, there’s a plethora of laptops and phones to choose from, not to mention a MiFi, two cameras, a pair of wireless keyboards, an iPad (s aapl) and more. Some of my gadgets have been replaced over time thanks to converged functionality. For example, I sold an Amazon Kindle 2 (s amzn) after buying my iPad; a few days of enjoying my Kindle books on the Apple tablet convinced me that I no longer needed my Kindle. That tradeoff made sense, and while not everyone would have made the same decision, it did reduce my mobile device load by one piece of hardware. On the opposite side of the spectrum, I found myself last night considering the purchase of a Galaxy Tab. Samsung has quickly sold one million of these popular 7-inch Android tablets. Why would I buy one when I already have an Apple iPad? The reason actually applies to all of my devices: no one device fully takes the place of another because of compromises in functionality. Smartphones haven’t replaced laptops, and tablets don’t take the place of either, for example. Instead, as features are improving across all devices, form factors are evolving, which means we have more device choices for use in different contexts and locations. My consideration of the Galaxy Tab is a perfect example: It appeals to me because it’s lighter and smaller than my iPad, but still offers much of the same functionality. That means I’m more likely to travel with the Tab, while my iPad is better suited — for me, anyway — around the house in places I don’t want to use a traditional computer: the couch, in bed, etc…. Of course, I’m heavily invested in iOS apps, so due to the “app lock in” costs, I’m not likely to trade in my iPad for the Tab! I face a similar challenge when it comes to leaving the house with a camera. You wouldn’t think so, because the camera is the perfect poster child for device convergence: point and shoots are quickly fading in popularity due to improved smartphone cameras. In fact, the New York Times (s nyt) recently reported an 18 percent decline in the sales of point and shoots since 2008, largely due to phones with solid cameras. But when I cover the Consumer Electronics Show next month, readers won’t want to see marginal, camera phone pictures; they’ll want high-quality images and videos. I have to balance mobility with functionality. I have an excellent DSLR in my Canon T1i (s caj), but there’s a problem: That camera is too bulky and heavy to effectively navigate the sea of attendees at CES. If that’s the case (and it is, given my past experience) and a smartphone camera just won’t do, what do I do? You guessed it: I just added a superb point and shoot to my device collection, the Canon S95, which fits in a pocket. So now I have yet another device to either carry or choose from, not just because of functionality, but because of form, weight and other factors. Amid continuing advances in technology, one theorem still holds true for mobile devices: Every single one of them is a product of compromise. Want your laptop to run longer? That can be done, but you’ll either have to give up processing power or be stuck carrying an extended battery. Gotta have your latest videos filmed in 1080p? You’re not doing that on a smartphone yet, so you’ll need to tote a separate camera. Devices are getting better, and everything is moving away from the desktop as consumers want to enjoy apps and services on the go. But for some reason, I feel like all of the improvements in mobiles are just weighing me down. Put another way: My mobile needs used to be met with a laptop and a phone. Now my hardware stack is getting so big I can’t carry it all. Am I alone in the quest for the perfect set of just a few gadgets that can really everything I need? Forgive me, but I think the writer here is quite misguided. If you’re taking professional photos you bring a dslr camera. You don’t have “problems navigating” the crowds with it. You learn what real photographers learn. You research where the products you want to shoot are, and you get there before it gets too crazy. You contact companies ahead of time, and secure a time to shoot, etc. If you have a proper smartphone it will take as high (if not higher) quality photos than a point and shoot camera. Those devices are for people who don’t have smartphones. This is just one example, but I think I could go on for nearly all the examples listed as to why there almost always is a “best choice” that will allow you to reduce your number of devices to 3 or less. Now, bringing cords around is still an issue, even with 3 devices, but that’s where organization (and rubberbands) can help! Valid point, Joe, but the Consumer Electronics Show is spread out on nearly 2 million square feet – and that’s just in the convention center. Individual vendors hold press events and private meetings at virtually every hotel on and just off the Strip in Las Vegas. I once tracked my daily walks at CES and came up with an average of more than 6 miles walking per day. Yup, it’s an extreme case and proper planning helps, but every ounce you carry counts against you so compromises must be made. I know your ind Kevin. I normally carry my work provided laptop and blackberry plus my personal iphone and Motion M1400 Tablet PC. I keep one personal calender and task list with both work and personal stuff on them. My calender and task lists are accessed by my personal tablet or the iphone using my hosted exchange account. Our IT department will not provide tablets or let me put my tablet on the network so i take notes in onenote on the tablet and then sync them at the end of the day to my work laptop. We are not allowed to use our blackberries for personal calls. Plus web access is easier on the iphone. Its a clunky system, but it works for me. I am waiting to see if the Asus EEENote is anygood. I’m hoping it will replace my old heavy tablet pc for note taking. If not, I might have to get one of those HP500s. The more I carry the iPad the more I feel how big the device is and really tempted to get the Galaxy Tab instead. However all the reviews out there does hold me back a bit and probably waiting for Blackberry Playbook instead (since I am married to my Blackberry pretty much). The next acquisition that I am planning to have is the new Macbook Air 11 inches. I still have my MacBook Pro and Sony TZ and both have serve me well. I am hoping with the new MBA, it will consolidate the 2 laptops that I have (where I love the Mac OS but definitely love the portability and the long battery life of my Sony TZ – btw, my Sony TZ is the hybrid SSD and 250G hard drive model). Galaxy Tab and Xperia X10i for me, they are both always connected to the web anyway so no need for a mifi, The cameras and vids are good enough on both for me for the snaps/clips i need to take. I have uk plug sockets in my car for fast charging and never need to take the tabs power supply with me if im out just for the day, the phone on the other hand sometimes needs a quick charge after half a day. it would be nice if a smartphone lasted a full day of heavy usage on its own battery. Years ago, I remember carrying a handheld Garmin GPS, a Palmpilot, and a cell phone. I used to think it would be cool for those devices to converge. And now look at what we have! Awesome progress! Great article! I’ve taken a different approach. As someone who has had an ever-present laptop on my shoulder and smartphone in my pocket, I decided that neither were necessary or even adding much to my life or productivity/connectivity in the truer sense. So I sold the laptop and the iPhone and got a smartphone that I lobotomized with a month-to-month voice/text only plan. Google SMS services and Facebook/Twitter Text mean that I can do the basics while not spending my out and about time staring at a screen. Then I take my iPad for times when I think time sensitive email needs to happen. Otherwise people can call me or it can just wait. I feel about 200 lbs lighter! Are you getting a Nexus S? Thanks Pete. I’m not likely to trade up my Nexus One for a Nexus S at this point. Not enough of a hardware upgrade considering I paid $529 for a no-contract Nexus One back in January. And I should see Gingerbread on the Nexus One within a few weeks. Hey Kevin, I see your not taking the iPad to CES2011. Maybe you’ll get the Galaxy Tab. ;-) I’m enjoying the Tab I got last Saturday, but I am still using my iPad. The Tab will be more for on the go use instead of the iPad. Can’t wait for Honeycomb so it can be more tablet friendly. 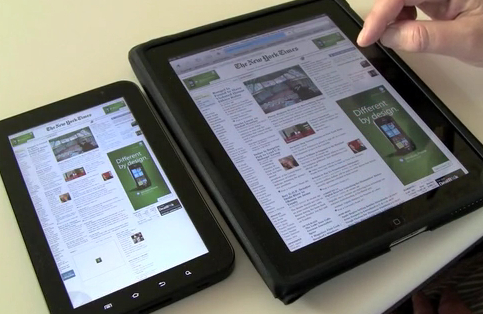 Not that Froyo is not, but things could be more tablet friendly. They need to update the copy/paste on Android to make it easier to do that. On iPad I just tap and drag to highlight to select and copy. I think the rich multi-verse of devices a good thing, esp from the stand point of security. I know some people seem to live for the hack, not that I do anything anyone would want to know about, but the diversity spreads the risk around. Just look at the emergence of the different OS’s now. Back in the day when winblows was king. Everyone shared it’s vulnerabilities. I think the same thing would happened if we all rushed to the same device. Near to loose mobility, since the weight is up to 15 lbs !!! I carry a nexus one in my pocket and a spare battery if I’m going to be away from outlets for more than 12 hours. The right software and a bit of practice with the virtual keyboard and why do you need to carry around all that expensive electronic gear?? If I’m away from home for an extended period (where there is a laptop), I do have a folding keyboard for the nexus. Simplicity and less consumption of gadgets (and everything else for that matter) might be an option for you to consider. Same here! I have 2 mobile phones with different carriers…I just got an iPad but I found myself with my laptop and iPad yesterday because some things are still best done with a laptop. And when I travel out of the country, it’s always a whole discourse on which gadgets to bring! And we thought the gadgets have made our lives simpler? Before it’s just a notebook, pen and a paperback! I think I have come up with a perfect solution. 7 inch tablet(Samsung galaxy tab) with a 13 inch laptop(Toshiba portege r705). Tab fits in my pocket most of the time so its no issue…..it can replace a smart phone with always on internt with voip. I do have a tiny featured phone for a scenario where internet is not available. I dont see how 10 inch tablet fits into anyone’s picture? if you are going with 10 inch you might as well go with 13 inch full featured laptop. if you want mobility, go with 7 inch….it fits in your pocket! I recently got an IPad and an Apple Case, and I always travel with those. So, yeah. Basically my gear bag’s been cut by more than half, and I can’t say I miss the old stuff. Mostly, when I’m on the road, I just need an 11 month old Droid (I tried the Samsung Fascinate but went back). Camera is adequate, it plays video and audio well enough and with LogMeIn I can access my Mac. K-9, SMS, Tweetcaster and Gmail keep me in touch. As a bonus, the Kindle app works well, its got a flashlight and the CardioTrainer app rounds out my needs. Of course I have to pack the charger, too. My traveling needs are reduced from pounds to ounces to apps and bytes! Of course at home I have the Mac, an iPad, too many iPods to count, a camera and an Acer Aspire One. Everything depends on what you need it for, but when the emphasis is mobility, two devices beats four! Why carry a keyboard, slate, mifi and smartphone when just a smartphone and netbook would perform the same yet be easier to carry? When my notebook is overkill, I use a netbook, and the same when going with my smartphone. In my particular case, I carry a mifi along because I use prepaid voice on my smartphone, so the mifi provides data for three of my devices. Do I carry a separate camera? No, because the camera on my smartphone is adequate for posting images on the web. Were I authoring blu-ray discs, however, a dedicated 1080p camera would be my main tool. There comes a point, however, where having multiple devices of the same type is simply excessive. I can understand having a notebook/netbook/smartphone trio. But when people complain that they MUST HAVE 2 notebooks, 2 netbooks, 2 slates and 2 smartphones, the question comes to my mind – what the hell is this guy doing? The right tool for the job, but your toolbox is only so big. I make do with an iPhone, DMC-ZS3 and an iPad when on the move, and add a laptop (MBP) for the remainder of my work… not sure why you need a T1i (I have a DSLR but it’s only for personal stuff). If I were more moneyed I’d consider replacing the ZS3 with a 4/3 lens camera.